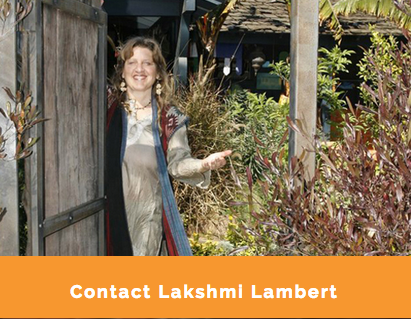 Lakshmi Lambert provides a level of deep healing you will not find elsewhere. Throughout the years I’ve had numerous encounters with healers and their various modalities, some good, some great, some not so. Lakshmi combines knowledge, passion and wisdom while encouraging communication to achieve stunning results. I’m grateful for the opportunity to work with Lakshmi Lambert. Simply the best. – Doug L.
Totally recommend Lakshmi. The reason I was looking for acupuncture treatment was a back ache due to a lower disc hernia. My doctor gave me a referral. However, what I really found was somebody who took the time to get to know me and really help me through my recovery process. What began as a specific therapy has become a time of general wellness and illumination. Lakshmi is a unique person and will help you feel better, and be better. – Pioter G.
If you are looking for a true healer – someone who is completely devoted to bringing you to optimum health – emotionally & physically – then you should visit Lakshmi Lambert. I’ve seen numerous acupuncturists & Chinese herbalists over the years, but none compare, even remotely, to her. She has treated me for walking pneumonia, back & neck pain, broken toes, sprained ankles, severe allergic reactions, skin problems, female issues, and depression & anxiety. In addition she practices Homeopathy and I’ve experienced extraordinary results from those treatments as well. She is kind and gentle, and her home is a true sanctuary. You will literally float out of there. – Robin F.
Was very lucky to meet Lakshmi and receive a reading from her. It’s clear she has a lot of experience in the way she interprets the cards. Lots of insight. I would definitely see her again! – Ke. Lakshmi Lambert is an absolute phenomenal holistic doctor. Her experience, patience, and insight have helped me time and time again. In my most recent situation, an ear infection had caused my hearing to be lost for 10 days. She saw me last minute on a Memorial Day. Following her instructions, and taking the medicine she suggested, the next morning I could hear out of both of my ears. She is expert in so many areas, and really gets to the root of the problem. Not just a band aid, her treatments last, and my problems have never reoccured. I HIGHLY recommend Lakshmi as a holistic doctor. – Krishna M.
After one cold morning surf, my back felt sore. For the next two weeks it seemed to get a little worse each day. But Lakshmi did an amazing job at fixing my back pain with acupuncture. I saw her for a sessions on a Wednesday and then a second session the following Friday, and the following Saturday I was able to surf again. While I doubt serious back problems can be healed with such ease, I was still amazed at how quickly the acupuncture helped me out, especially when nothing else seemed to help at all. I would recommend Lakshmi to anyone looking for acupuncture and other holistic treatments. – Rob M.
Lakshmi is the most talent healer I have every had the opportunity to be treated by and work with. I always feel from her that nothing matters more to her than helping her patients heal. She is the kindest and most loving Holistic healer I have ever know. She is intuitive, well educated, kind, caring, deeply motivated to help other and has a wonderful practice. I am honer to know her and be a part of her life and practice. – Jenny Vaughn C.